I often find myself making a lot of GAPS Diet-style meals this time of year, as soup comes into its own when the temperature drops. 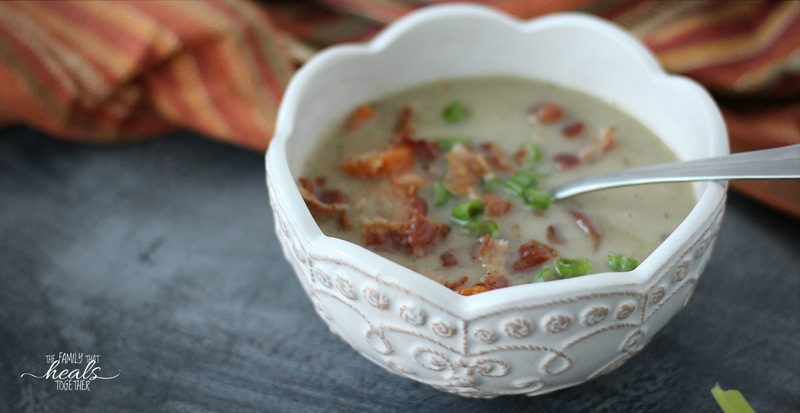 Lately I’ve been experimenting with AIP-friendly food too, so came this easy clam chowder recipe you can make in your Instant Pot! Find the recipe below. The only memory I have of eating clam chowder (aside from occasional junkie seafood restaurant fare, which isn’t even that good!) is on the Oregon coast when I was a kid. We used to make the long trip from New Mexico to Oregon to visit my mom’s dad and step mom and to this day, the Oregon coast is one of my favorite places to visit. We would drive down to the cold beach (it stays pretty chilly year-round, I understand), walk out into a large patch of sand, surrounded by pockets of pooled water, get down on our knees, and start digging. It’s the only time in my life I can remember not minding getting my hands dirty. That’s because as you dig, you find treasure: clams. And then you get to take those clams home and your grandparents teach you how to make a delicious pot of soup out of them. To be honest, I have no idea now how we made that clam chowder, but my easy clam chowder recipe below hits the mark and takes me back to my clam digging days. I did try to find some fresh clams at my local seafood counters, with no luck, so I settled for high-quality canned clams, with no junkie additives or preservatives. I stock up on them here for a good price (and, by the way, if you click that link, you can get 25% off and free shipping on your first order!). It’s also where I buy fish sauce. Whether you’re a long-time lover of clam chowder, or you don’t eat it often (up until a couple weeks ago, my kids had never tasted it- but they love it! 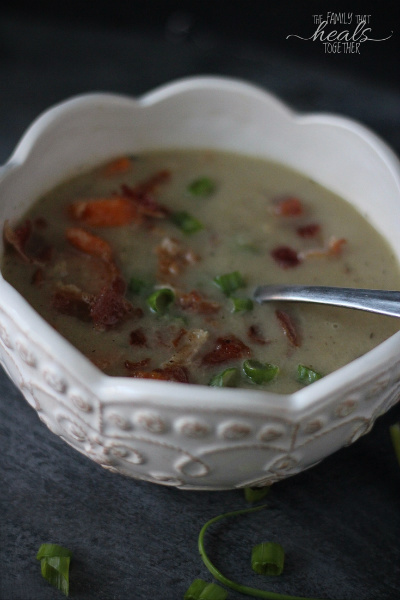 ), I hope this easy clam chowder recipe will become a favorite in your house as it has mine. The directions call for an Instant Pot, but I’ve added instructions should you want to make it in a crock pot or on the stove top. I do adore my Instant Pot so much though. In fact, this is the first and only recipe I’ve shared using the appliance. I’ll have to remedy that! It’s also Whole30, GAPS diet, paleo, and AIP-friendly, which means it’s super nourishing. Do yourself a favor and whip up these AIP pita breads from my friend Jen at Predominantly Paleo while you’re at it and get to dippin. Select "saute" on the Instant Pot and add your fat. Add the sliced onion, crushed garlic, salt, and pepper (if using). Saute onion and garlic for 5-10 minutes, stirring frequently to prevent sticking. Add broth and cauliflower and continue cooking until cauliflower is soft, about 10-15 minutes. 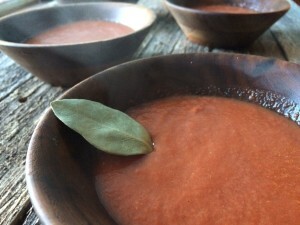 Press "cancel" on the Instant Pot and transfer contents to a high-powered blender, or use a stick blender to puree until a smooth, creamy soup base forms. Return to Instant Pot. Add clams (and the juice from the can), sliced carrots, and fish sauce and stir. Press "soup" button and adjust time to 20 minutes, attach lid, and ensure vent is closed. Instant Pot will build pressure then begin counting down the time remaining on the display. Once the soup is done cooking, the Instant Pot will beep. Allow the pot to sit while the pressure slowly releases (10-15 minutes) before removing the lid. The silver indicator next to the vent will go down once it's safe to remove the lid. Alternatively, you can manually release the pressure by opening the vent; again the silver indicator will go down when pressure has been relieved. 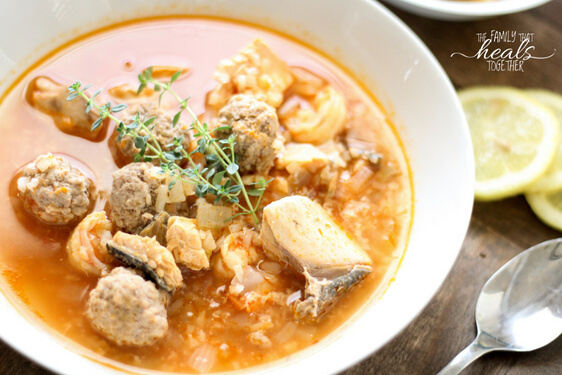 If you prefer to make this in a crock pot, start by doing steps 2-4 in a medium-sized pot on the stove top before transferring contents to the crock pot. Complete remaining steps in the crock pot and cook for approximately 4 hours, until carrots are soft. Likewise, if you would like to cook the soup on the stove top, after blending, return contents to a large pot on the stove top, add remaining ingredients, and simmer for approximately 1 hr, until carrots are soft. 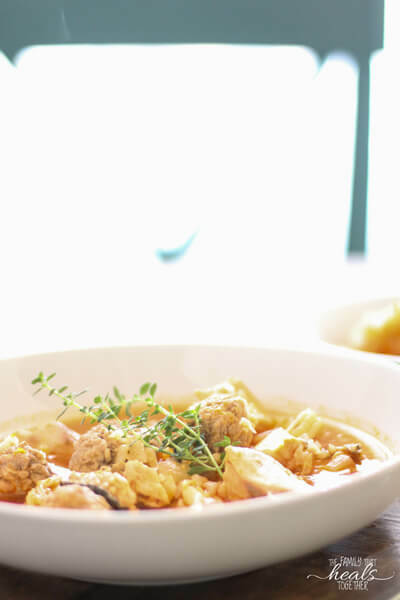 Share this easy clam chowder recipe using one of our links below. Creme Fraiche… it sounds so fancy! Yet, it is the simplest food to make, which is very nice and welcome in the early days of GAPS intro. You need only two ingredients, which take just a moment to combine, then you leave it and forget about it for a whole day. That’s all! Because we tolerate dairy well, we have had no problem using this from day one of GAPS intro (read more about our experience and why we’re doing GAPS here). 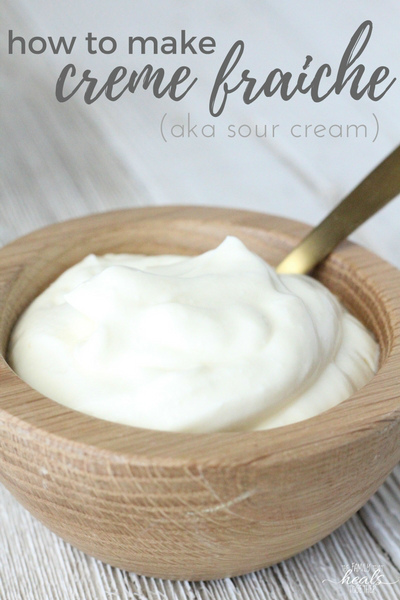 We already loved sour cream, so to have a food that we enjoy available to us when our food isn’t always especially appetizing is a great treat! Plus, adding in some creme fraiche into my boys’ soup bowls makes them that much more likely to finish it off… and lick the bowl after! Do you need kefir grains? These are my favorite ones to use- they’re simple and effective and make perfect kefir every time. Just so we’re clear- this is dairy kefir, not water, which is not allowed on the GAPS intro diet. Creme fraiche, or sour or cultured cream, is a staple on the GAPS intro diet, both for its health benefits and delightful and flavorful addition to soups and other foods. 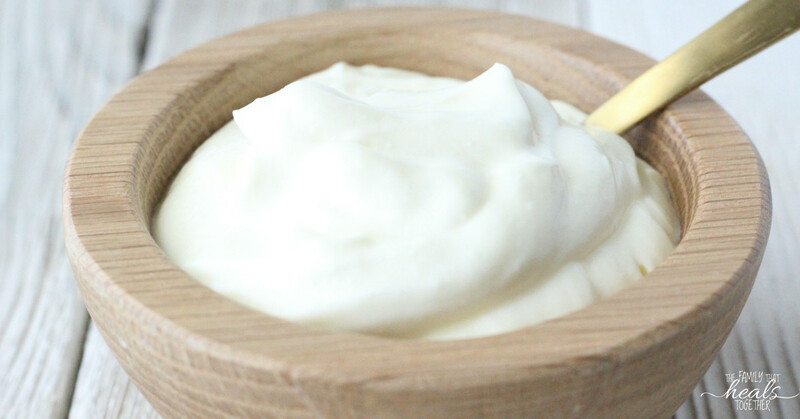 Combine cream and kefir in a jar with an airtight lid. Secure lid and give it a vigorous shake to combine ingredients. Let sit for 24 hours, until thick and creamy. We are still hanging strong on GAPS intro, and I’m not sure when we’ll venture off of it, but I’m enjoying the healing benefits we’re experiencing for the time being! I’ve had to continue getting creative while we are eating a TON of soup, because having the same soup every day becomes so monotonous. 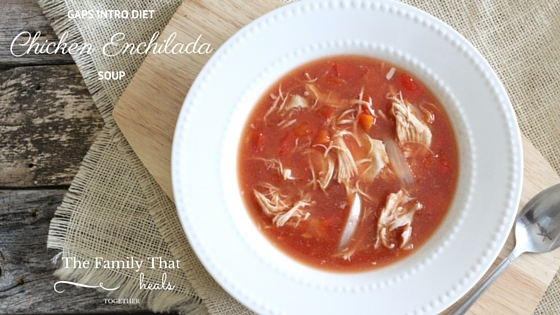 I’ve been making this chicken enchilada soup for a couple weeks now, and as we’ve been able to add in more foods like avocado and spices, it just keeps getting better. Even on early stages, without those things, though, this soup is pretty great- and a nice change from typical bland soups. I’ve been taking advantage of organic tomato puree as a way to quickly flavor stocks and soups. While tomatoes can cause inflammation for some people (particularly those with an autoimmune disease), we don’t seem to have any trouble with them. And while foods should be prepared freshly in your kitchen, I’ve found that this is a corner I feel fine about cutting. I make sure to buy pure, organic tomato puree in a jar (not a can), so I’m not adding any non-GAPS intro foods or ingredients. This is a great one to try. 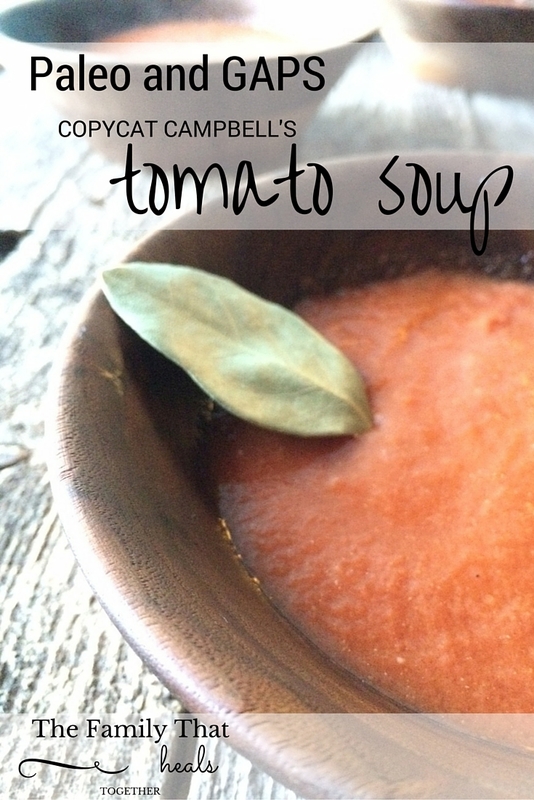 However, you can easily puree fresh, organic or homegrown tomatoes in your blender and use in the soup as well. 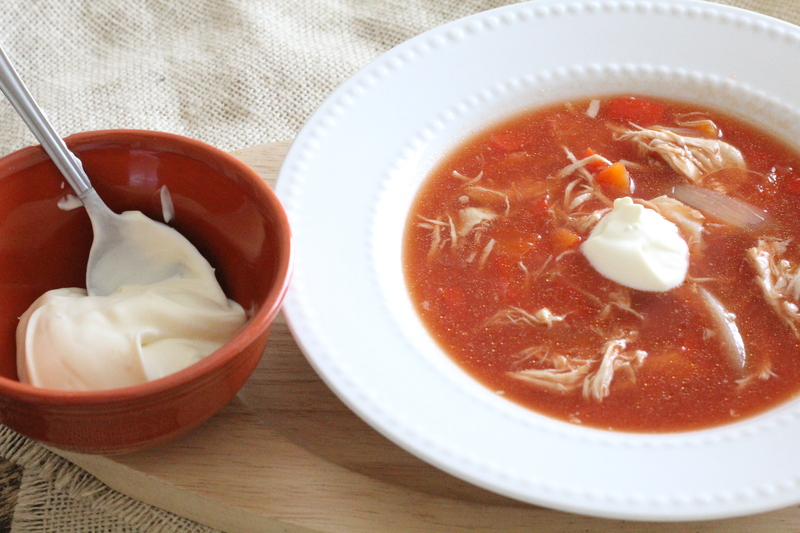 Be sure to check out how to make poached chicken so you’re prepared with chicken stock and shredded meat for this recipe! 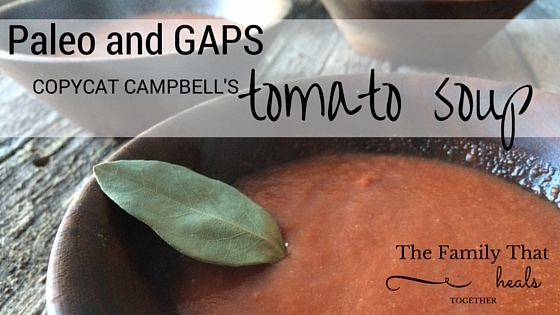 If you need a fresh take on soup on the GAPS intro diet, try this flavorful, (optionally spicy) soup! 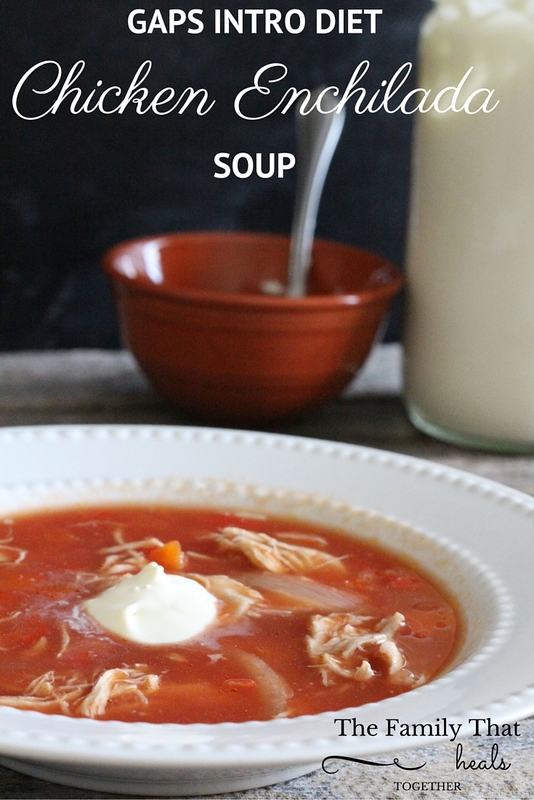 Combine tomato puree and stock in large stock pot.Add shredded chicken, sliced vegetables and spices and whisk until well mixed. Bring soup to a boil, then turn down to a simmer for 30 minutes. Ladle into individual bowls and allow to cool slightly before adding toppings, so as to leave cultures in creme fraiche intact. For stage one ingredients, leave out the chili powder, avocado and cilantro. Stage two can include fresh herbs; stage three, avocado; chili powder can be introduced on stage five. 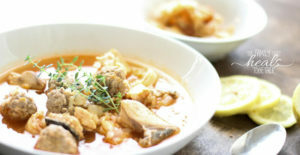 For added nutrition on stage two, mix a raw egg yolk into each bowl of soup. There are lots of junk foods I miss from my pre- real food days. Oreos, chips, even candy. But nothing brings back such fond memories as Campbell’s tomato soup. My mom used to make it when I was a kid, and I made it most of my adult life (and I use the words “made” and “make” loosely, as pouring soup from a can and heating it up isn’t really “making” it ;). 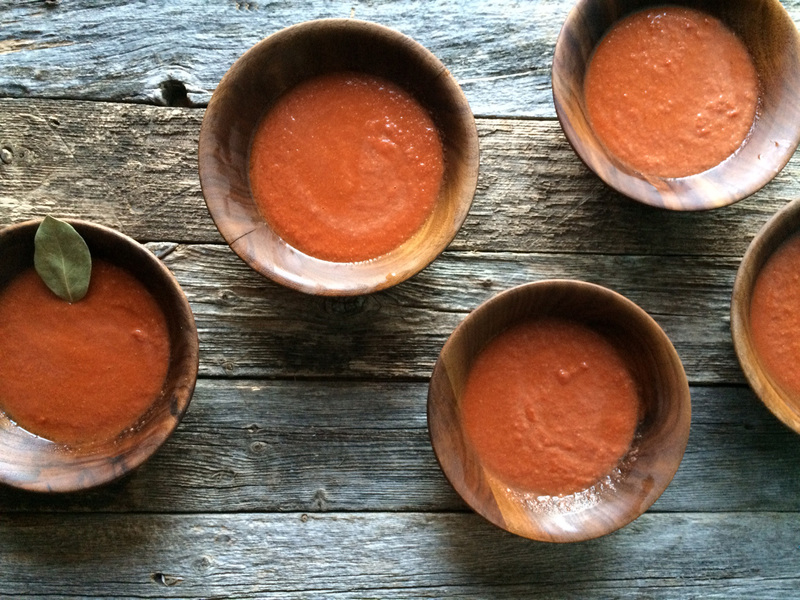 I’ve tried lots of tomato soup recipes since then, but they always fail to satisfy. I finally set out to recreate my favorite soup myself, and have found that it is comparable to what I remember that canned creation tasting like! Find the extremely easy recipe below! Blend everything but the bay leaves together in a blender until smooth, then transfer to a large pot, adding the whole bay leaves. Bring to a boil, then simmer for 30 minutes. Ladle into bowls and let cool before serving.